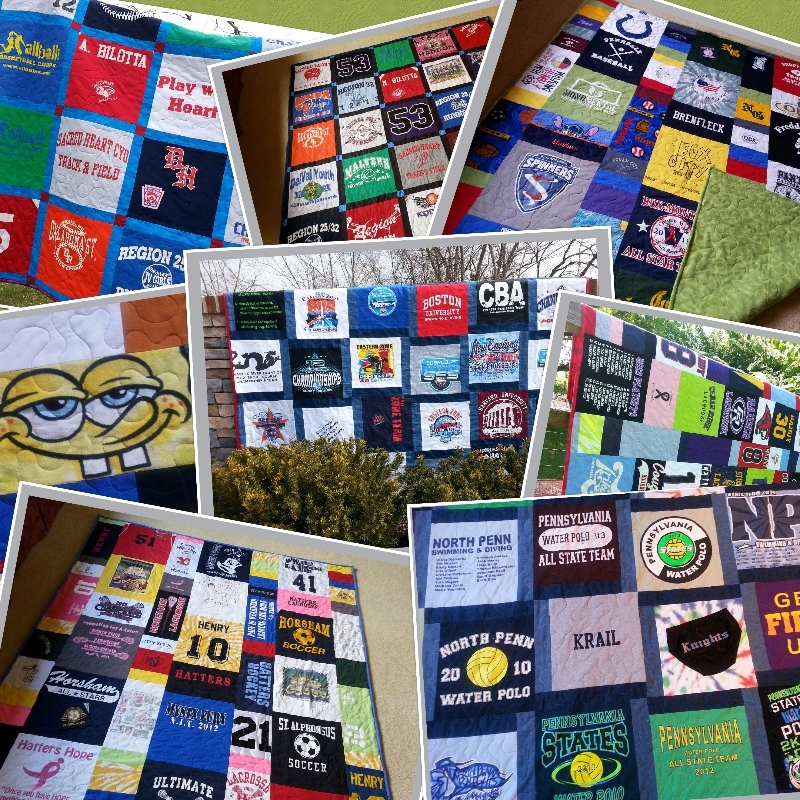 5 STYLES OF MEMORY QUILTS, check them out! Home Photos Order Form Media & News Quilt Care Quilts for Everyone! This past month has been filled with beautiful weather, beautiful quilts, and beautiful people! It has been my pleasure to create tapestries of memories for many of you! I feel so blessed to have gotten to know many of you and I sincerely hope my quilts have brought comfort and smiles to those of you that have received them. As always, if you are interested in a Memory Quilt, for any occasion, please contact me so that I can add you to the list. Currently, I have 22 quilts on my schedule. Turn around time is about 5-6 months, so please plan accordingly. Remember quilting takes time! PS. After three years of newsletters, I have decided to shake up my salutation ;) This month Spanish, next month french! I chose this Christopher Dock graduation quilt because I love the colors in it! The purple, lilac, and apple green colors really make this modern style lap quilt stand out! Also, this is my first Christopher Dock quilt! 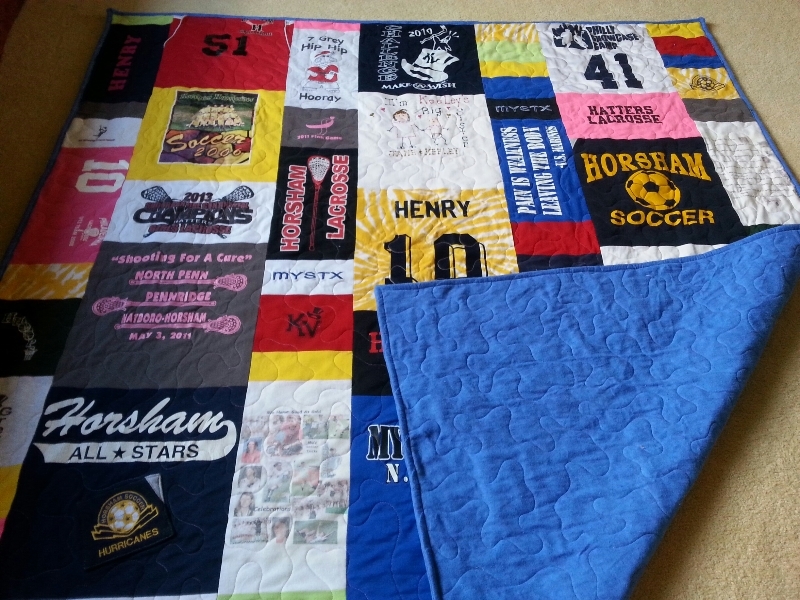 As you can see, this quilt tells the story of Karalyn's journey through school: attending Penn View Christian School, and CD, while playing field hockey and soccer. She was also a volunteer and staff member at Spruce Lake, and participated in the Phantom of the Opera play. 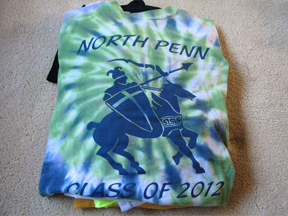 Notice the homemade field hockey shirt made by Karalyn! Karalyn will be attending Messiah College in the Fall and we wish her all the best! Karalyn opening her Memory Quilt at her graduation party! Karalyn walking down memory lane with her dad, perhaps pointing out the irreplaceable homemade field hockey shirt that she made that was included! I just love the homemade shirts! Don't Trust your Shirts To Just Anyone! All of the homemade shirts that I receive give me goose bumps because each and every one of them illustrates a time in a person's life so beautifully. Please don't trust these shirts or any other precious memory items to just anyone. These Memory Quilt items are irreplaceable so make sure that the person or quilt company that you select is a reputable one and is going to take care of your items and sew them properly. The apple green field hockey shirt that Karalyn made in the CD quilt above is a perfect example of how unique and beautiful these shirts are! The shirt below is truly special because it captures a time in Jane's life beautifully! 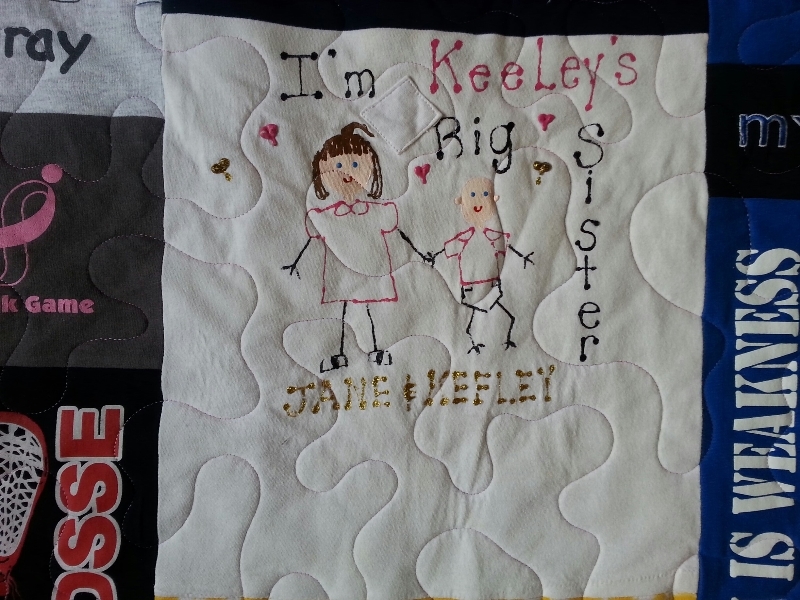 Big sister Jane made this shirt upon learning that she was Keeley's big sister-priceless! I do my best to highlight these shirts and I also handle them with extreme care when cutting and sewing because they cannot be replaced. Homemade shirts are simply the BEST! The one below was a 60th anniversary pillow given to a sweet couple by their daughter. A beautiful poem is centered between their wedding photo and a current photo. The pillow shown below on the left was made for a graduating senior. It was made in addition to her Memory Quilt. The pillow shown below on the right was made for a man who loves his Crown Royal. Each bottle of Crown Royal comes in a purple flannel bag. I used "several" of these bags that Jon had collected over the years and made this pillow for him. I do believe he is currently collecting more bags! Cheers! The pillow above was made for an adorable child named Olivia. It is made up of her sweet baby clothes that represent all of the special family members in Olivia's life. All pillows shown are my 20" pillows. I can make a smaller 14" version. Both sizes are made with the best cording and are backed with super soft fleece. All I can say is whew! 24 graduation quilts are almost complete! I am still working on four that have a delivery date of August-just in time for college! I can't get over how each and every one of these quilts tell such a unique and wonderful story! The Modern style seems to be then most popular within this group, followed by the Staggered and Traditional style with block sashing! A record seven full size quilts were ordered, but the most popular size within this group was the lap quilt. Red Barns and Quilts: Perfect Together! Some of you know that I have always wanted a picture of one of my quilts hanging from a beautiful rustic barn. Currently, this is as close as I have gotten! Maybe some day I will find someone with a barn that I can manage to hang a quilt from and snap a picture of the quilt hanging from it! From Walton Farm, to Pennfield Middle School to North Penn High, this full size quilt tells a remarkable story of Matthew's youth! North Penn Tennis and golf, Phillies World Series game, US Open matches, and vacations at the beach, such special memories for Matt. His journey continues on at Penn State. We wish him the best. Water Polo, Water Polo, and more Water Polo is illustrated so beautifully in the full size quilt modern style shown below. This special graduate went to states for water polo, swam with the Lansdale community swim league in the summer and is attending Washington and Jefferson College to continue his water polo career in the fall. We wish Jonathan the best of luck! Some might say Memory Quilts by Molly is a social butterfly. It's true!